To promote such runaway optimism, the authors introduce a classification scheme attempting to categorize biological innovations. They maintain that biological innovations can be put into three categories: (1) the Critical Path model; (2) the Random Walk model; (3) the Many Paths model. Each transition requires preconditions that take time to develop...Once the necessary preconditions exist on the planet then the transition will occur in a well-defined timescale. It is like filling up a bath tub; once you turn on the taps, the bath will fill up. It just takes time. Each transition is highly unlikely to occur in a specific time step, and the likelihood does not change (substantially) with time. 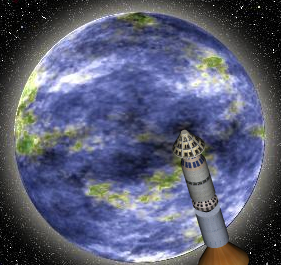 This may be because the event requires a highly improbable event to occur, or a number of highly improbable steps....Once life exists on a planet, ultimately the key innovation will occur, but when it occurs is up to chance, and whether it occurs before the planet runs out of time and becomes uninhabitable is not knowable. Each transition or key innovation requires many random events to create a complex new function, but many combinations of these can generate the same functional output, even though the genetic or anatomical details of the different outputs are not the same. So once life exists the chance that transition will occur in a given time period is high, but the exact time is not knowable. There are no specific preconditions for a Many Paths process other that prior existence of life that can achieve the innovation. However, once any appropriate precondition is met, the innovation will happen fairly reliably some time afterwards (as measured in generations). So it it almost inevitable that the innovation will occur eventually. But because there are many ways that it can occur, then each time the function will be carried out by a different mechanism. Throughout the book again and again the authors attempt to convince us that particular types of biological innovations that occurred on Earth were examples of a Many Paths process, and that we should therefore expect to see them commonly on other planets. The logic of the authors seems to be something like this: when nature shows us there are many ways in which a particular biological innovation can be implemented, we can call this a Many Paths innovation; such innovations are pretty likely because there are many ways they can be implemented, not just one way. But such reasoning is very fallacious. To judge the likelihood of something, we should not merely consider whether there is only one way that it can be achieved, or many ways. We should instead consider the ratio between the outcomes that do not achieve such a result and the outcomes that do achieve such a result. An example of the Many Paths Model is the evolution of imaging vision. Eyes that can make images of the world (not just detect light and dark) have evolved many times in insects, cephalopods, vertebrates, and extinct groups like the trilobites. But you would be committing a great error in logic if you reasoned like the authors, and suggested that it is fairly likely that a vision system would evolve, because there is not just one way to make a vision system, but lots of ways. A better line of reasoning would involve comparing the number of ways to arrange matter that do not result in functional vision to the number of ways that do result in functional vision. That would give you a ratio of more than 1,000,000,000,000,000,000,000,000,000,000,000,000,000,000,000 to 1. From such a perspective the appearance of a vision seems fantastically unlikely. It is fallacious to argue that something is relatively likely to occur because there are many ways for it to happen. Using such reasoning we might argue that there is a pretty good chance that tornadoes passing through a junkyard will one day assemble a car by chance, because there are many different ways to assemble a car from parts in a junkyard. Even though there are many types of automobiles, the number of arrangements of matter that do not result in automobiles is more than 1,000,000,000,000,000,000,000,000,000,000,000,000,000,000,000 times greater than the number of arrangements that do result in automobiles. So the chance of an automobile appearing in such a way is incredibly low, despite there being many different ways to make a car. Because we do not show some outcome is likely or show that it even has one chance in a trillion quadrillion of occurring by showing there are many ways to achieve the outcome, the classification scheme offered by the authors of The Cosmic Zoo is misleading, and should not be used. But is there some better way to classify biological innovations, some classification scheme that might shed a little light on the chance of them randomly occurring on other planets? Let me sketch out such a classification scheme. The categories are below. The difficulty level refers to how hard it is for the biological innovation to occur by random mutations and natural selection. The difference between the difficulty of achieving biological innovations in Category 3 and Category 4 is an exponential difference, which we can colloquially describe as “all the difference in the world.” I can give an exact numerical example to illustrate the difference. Let us imagine that some biological innovation requires five complex components, each of which is individually useful once it occurred. If a species consists of a million organisms, it might be that there is (on average) only 1 chance in 100 of each of these components arising by chance in this population during a 50-million year period. But if each of these components is useful by itself, once such a component appears in the gene pool a “classic sweep” of natural selection might cause all of the organisms to get such an innovation after several generations. So over the course of 50 million years, the overall likelihood of the biological innovation occurring in the population might be only a little less than 1 in 100 to the fifth power, which equals 1 in 10 billion. Those are pretty steep odds, but not totally prohibitive odds. But let us imagine that some biological innovation requires five complex components, each of which is not individually useful once it occurred, and each of which is not useful until all of the five components have appeared in a single organism. If a species consists of a million organisms, it might be that there is (on average) only 1 chance in 100 of each of these components arising by chance mutations in this population during a 50-million year period. But if each of these components is not useful by itself, once such a component appears in the gene pool there would not be any “classic sweep” of natural selection that might cause all of the organisms in the population to get such an innovation after several generations. Chance of first component appearing in gene pool per 50 million years: 1 in 100. Chance of second component appearing during this period in an organism already having first component: 1 in 100 multiplied by less than 1 in a million. Chance of third component appearing during this period in an organism already having first and second components: 1 in 100 multiplied by less than 1 in a million. Chance of fourth component appearing during this period in an organism already having first, second, and third components: 1 in 100 multiplied by less than 1 in a million. Chance of fifth component appearing during this period in an organism already having first, second, third, and fourth components: 1 in 100 multiplied by less than 1 in a million. These are all independent probabilities, and to compute the overall likelihood of all of these things happening in this population during the 50 million years we must compute the first probability multiplied by the second probability multiplied by the third probability multiplied by the fourth probability multiplied by the fifth probability. This gives us an overall probability of less than 1 in 10 to the thirty-fourth power (less than 1 in 10,000,000,000,000,000,000,000,000,000,000.000). These odds can be described as being totally prohibitive. We would not expect such an event to occur even once in the history of the galaxy, even if there are billions of life-bearing planets in the galaxy. Do we see any of these Category 4 innovations occurring in earthly history? Yes, we see them occurring rather often. One example is the appearance of a vision system. If we consider a minimal vision system consisting of several eye components, an optic nerve, a part of the brain specialized to interpret visual signals, and at least one fine-tuned light-capturing protein, then we have a system consisting of at least five or six components, all of which are necessary for vision. Numerous other examples could be given of such Category 4 innovations. If we consider only random mutations and natural selection, we should not expect such miracles of innovation to be repeated on any other planets in our galaxy. Natural selection (which creates a “classic sweep” causing the proliferation of a useful trait) makes Category 3 innovations more likely, but does nothing to make Category 4 innovations anything other than fantastically improbable. 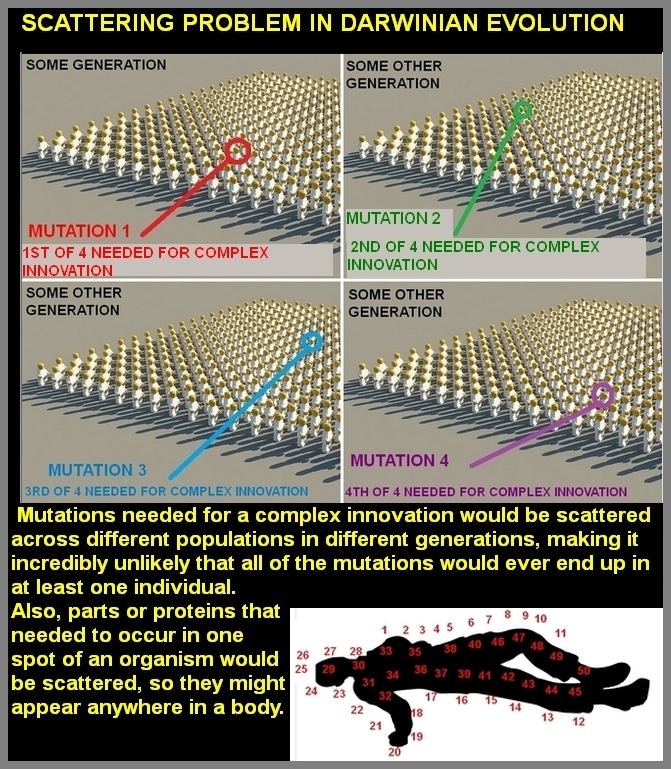 I call this type of difficulty “the scattering problem.” It is the problem that when we consider how the mutations needed for a complex innovation would (if they occurred) be scattered across the individuals of a population existing over multiple generations, it is exceptionally unlikely that all of the required mutations would ever end up in a single individual. This “scattering problem” rears its ugly head in every type of Category 4 innovation, in which the complex components needed for an innovation are not individually useful (meaning no “classic sweep” can occur until all of the components have appeared in a particular organism). I can illustrate this scattering problem through an analogy. Let's imagine you're some “ahead of his time” genius who invented the first home computer in 1960. Suppose that this consisted of 7 key parts: a motherboard, a CPU, a memory unit, a keyboard, a monitor, a disk drive, and an operating system disk. If you were to mail one of these parts on 7 different days, sending a different part each day to the same person, there might be a reasonable chance that the person might put them all together to make a home computer. But imagine you did something very different. Imagine you mailed each part in a different year, sending out the parts gradually between 1960 and 1965. Imagine also that each part was mailed to a person you selected through some random process (such as picking a random street and a random time, and asking the name and address of the first person you saw walking down that street) – a process that might give you any of a million people in the city you lived. What would be the chance that the parts you had mailed through such a process would ever be assembled into a single computer? Less than one chance in 1,000,000,000,000,000,000,000,000. The actual likelihood in this example is about 1 in a million to the seventh power, or 1 in 1042. It is comparable odds that a Darwinian process of random mutations and natural selection would constantly be facing in regard to complex biological innovations of the Category 4 type. 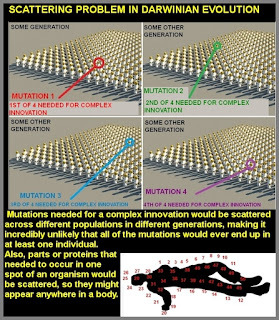 If it luckily happened that there somehow occurred in a gene pool all of the random mutations needed for some biological innovation, such gifts would be scattered so randomly across the population and across some vast length of time that there would be less than 1 chance in 1,000,000,000,000,000,000 that they would ever come together in a single organism, allowing the biological innovation to occur for the first time. The previous analogy involving computer parts serves well as a rough analogy of the scattering problem. To make a more exact analogy, we would have to imagine some parts distribution organization that persisted for many generations. Such an organization might send out one part of a complex machine in one generation, to a randomly chosen person in a city, and then several generations later send out another part of the machine to some other randomly chosen person in the city (who would be very unlikely to be related to the previous person); and then several generations later send out another part of the machine to some other randomly chosen person in the city; and then several generations later send out another part of the machine to some other randomly chosen person in the city. The overall likelihood of the parts ever becoming assembled into a machine with all the required parts would be some incredibly tiny, microscopic probability. This more exact analogy better simulates the scenario in which favorable mutations supposedly accumulated over multiple generations. Is there any way to reduce the scattering problem when considering the odds of complex biological innovations occurring by Darwinian evolution? You might try to do that by assuming a smaller population size. However, assuming a smaller population size is very much a case of “robbing Peter to pay Paul.” The reason is this: the smaller the population size, the smaller the chance that some particular favorable random mutation will occur in a gene pool corresponding to that population (just as the smaller the number of lottery ticket buyers in a lottery pool, the lower the chance of any one of them winning a multi-million dollar prize). So any reduction in the assumed population size should involve a corresponding reduction in the average chance of one of the favorable mutations occurring. The result will be that the incredibly low probability of the biological innovation will not be increased. In the calculations above, I don't even consider an additional aspect of the scattering problem: that the mutations needed for some innovation would be scattered not just over some vast length of time and not just over an entire population but also scattered in random positions of an organism (so, for example, some component needed for an eye would be far more likely to occur uselessly in some other spot such as a foot or an elbow). This consideration just shrinks the likelihood of accidental complex innovations by many additional orders of magnitude, making it billions or trillions of times smaller. The previous calculations involved the probability of only one organism in a population ending up with some biological innovation. The probability of such a biological innovation becoming common throughout the population (so that most organisms in the population have the innovation) is many times smaller. Evolution experts say that a particular mutation will need to occur many times before it becomes "fixated" in a population, so that all organisms in the population have the mutation. I did not even factor in such a consideration in making the calculations above. When such a consideration is added to the calculation, we would end up with some probability many, many times smaller than the microscopic probability already calculated. Instead of a probability such as 1 in 1032 we might have a probability such as 1 in 1050 or 1 in 10100. Probability 3: Probability that all of these mutations will ever end up in one particular organism, allowing the biological innovation to occur Some probability only a microscopic fraction of Probability 1-- perhaps a million trillion quadrillion times smaller. Probability 4: Probability that all of these mutations will ever end up in most of the organisms in the population Some probability many times smaller than Probability 3, and perhaps billions of times smaller. There is clearly a very strong basis for suspecting that something other than mere chance and natural selection was involved in all the biological innovation that occurred on Earth. Contrary to the naive claims of the authors of The Cosmic Zoo, if we use nothing but the explanations of orthodox Darwinists, we are left with bleak prospects for the existence of humanoid beings elsewhere in our galaxy. A more hopeful attitude would be appropriate only for someone willing to consider metaphysical and teleological considerations that might change the prospects dramatically. It would seem to make no sense for a SETI spokesman to be optimistic, unless he believes in cosmic teleology -- or unless he can specify some way in which non-humanoid extraterrestrials with a radically alien biology might appear without any of the ever-so-improbable Category 4 biological innovations occurring. But an orthodox Darwinist will continue to argue along the lines of “Innovations that occurred multiple times must have had a high chance of occurring randomly.” Below is a dialog that illustrates the fallacy in this type of reasoning. Let us imagine a conversation between a mother and a father, with a 3-year-old son. Mother: That son of ours is learning a few things. I notice that he knows the channel of his favorite TV show, because I see him repeatedly pressing three buttons on the remote, and getting his favorite channel on the first try. Father: No, that must be just chance. He's probably just randomly pressing number buttons on the remote. He probably accidentally gets the right channel often because there aren't that many channels. Mother: Are you kidding me? I must have seen our son fifty different times press three numbers on the remote, and get his favorite channel on the first try. That proves it isn't just chance. Father: Not at all. If our son got the right channel fifty different times, that just proves what I said – that there must be few TV channels, and that there's pretty good odds of him getting the right channel accidentally. Otherwise, he wouldn't have accidentally got his channel so quickly so many times. The father's reasoning here is very much in error. Each additional time that the son presses three numbers on the remote and gets his favorite TV channel on the first try is actually an additional item of evidence arguing against the claim that blind chance is involved. If there are ten such cases, it argues strongly against the accidental success theory, and if there are fifty such cases, it argues much more strongly against the accidental success theory. The father has simply taken evidence against his theory, and tried to convert it into evidence for his theory. His statement that “otherwise, he wouldn't have accidentally got his channel so quickly so many times” commits the fallacy of overlooking the possibility that something other than chance is involved, and assuming the truth of what the father is attempting to prove (an example of what is called circular reasoning). Similarly, each additional occurrence of a vastly improbable biological innovation is not evidence that such innovations have accidentally occurred but are instead additional reasons for doubting the theory that such innovations are mere accidents. Similarly, if you are playing poker with a card dealer who very frequently deals himself a royal flush in spades, this doesn't show that it's easy to get by chance a royal flush in spades; it's simply a reason for suspecting that something more than chance is involved.